The south-east of Amsterdam is divided in three parts: Bijlmer, Gaasperdam and Driemond. The biggest is the Bijlmer, which gained world fame in 1992 when an Israeli 747 crashed into two blocks of flats. Before that it was already notorious in Holland for its high levels of crime and its immigrant population from Dutch Antilles, Surinam and Africa the closest thing to a ghetto the Netherlands has ever had. The blocks of flats most are 10 storeys with 2, 3 or 5-room apartments were built in the 1960s for middle-class families, but by the time they were finished, nobody who could afford it wanted to live in them. 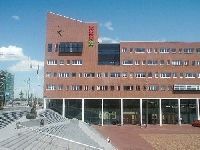 In the 1990s, the city started improvements, the most noticeable of which was the construction of the Arena Boulevard, with the Amsterdam Arena, home of soccer club Ajax and the American football stars of the Amsterdam Admirals, the Heineken music hall, the Pepsi stage pop music venues and a host of shopping facilities and offices. The development has created about 50,000 jobs, which will hopefully encourage a black middle class in the Bijlmer area and the construction of some 5,000 new homes, mostly for middle income groups. Its highly multi-cultural nature makes for excellent shopping; African art, Surinamese vegetables, Hindustan clothing can all be found relatively cheaply. The same multi-cultural character is visible in the many musical, cultural and drama-festivals in the Zuidoost quarter. Despite its good aspects, drug-related crime, poverty and litter are still huge problems in many parts of the area and, even when they are solved, the name Bijlmer will be notorious for many years to come. Apartments in the Bijlmer start at 300. One-floor living space in low buildings costs about 400. Apartments in Zuidoost cost the same as in Amsterdam west, but are a bit bigger. Expect a lot of more expensive and larger buildings in the coming years.